Forging is one of the oldest known metalworking processes. Traditionally, forging was performed by a smith using hammer and anvil, and though the use of water power in the production and working of iron dates to the 12th century, the hammer and anvil are not obsolete. The smithy or forge has evolved over centuries to become a facility with engineered processes, production equipment, tooling, raw materials and products to meet the demands of modern industry. Press Forgings: Press forging use a slow squeezing action of a press, to transfer a great amount of compressive force to the workpiece. 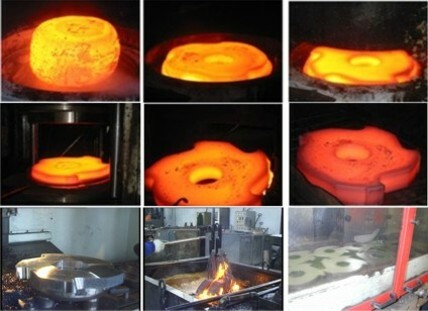 Unlike an open-die forging where multiple blows transfer the compressive energy to the outside of the product, press forging transfers the force uniformly to the bulk of the material. This results in uniform material properties and is necessary for large weight forgings. Parts made with this process can be quite large as much as 125 kg (260 lb) and 3m (10 feet) long. Upset Forgings: Upset forging increases cross-section by compressing the length, this is used in making heads on bolts and fasteners, valves and other similar parts. Roll Forgings: In roll forging, a bar stock, round or flat is placed between die rollers which reduces the cross-section and increases the length to form parts such as axles, leaf springs etc. This is essentially a form of draw forging. Swaging: Swaging - a tube or rod is forced inside a die and the diameter is reduced as the cylindrical object is fed. The die hammers the diameter and causes the metal to flow inward causing the outer diameter of the tube or the rod to take the shape of the die. Net Shape / Near-Net Shape Forging: In net shape or near-net shape forging, forging results in wastage of material in the form of material flash and subsequent machining operations. This wastage can be as high as 70 % for gear blanks, and even 90+ % in the case of aircraft structural parts. Net-shape and near-net-shape processes minimize the waste by making precision dies, producing parts with very little draft angle (less than 1º). These types of processes often eliminate or reduce machining. The processes are quite expensive in terms of tooling and the capital expenditure required. Thus, these processes can be only justified for current processes that are very wasteful where the material savings will pay for the significant increase in tooling costs. can you please cover some metallurgical abnormalities due to improper mechanical, thermal and cleaning processes on steels, stainless titanium high and low alloy steels?